Jarhead, shot by Roger Deakins, ASC, BSC, puts an existential spin on a Marine’s experiences during the Gulf War. When Anthony Swofford’s 2003 Gulf War memoir Jarhead first appeared in bookstores, Roger Deakins, ASC, BSC, snapped up a copy. “It was a really different and interesting take on the Kuwaiti war, but I really didn’t see it as a film,” the British cinematographer confesses. It’s no wonder: written by an ex-Marine who took part in Operation Desert Storm, the book is a nonlinear narrative that blends chronicle and essay, alternating between depictions of military life, autobiographical flashbacks, and raging asides on America’s role in the Middle East. Jarhead begins with Swofford (Jake Gyllenhaal), nicknamed “Swoff,” progressing through boot camp and pondering his past via brief flashbacks to his childhood in a military family, his blonde sweetheart, and his reasons for enlisting. The story then moves to Saudi Arabia, where Swoff’s division trains and waits in the empty desert for nearly seven months. Swoff tries out for the Marine Corps’ sniper platoon and is soon armed with state-of-the-art long-range rifles  but still no target. It’s not until the film’s third act that the troops finally see their first Iraqis, in the form of charred cadavers strewn along the Highway of Death after a series of U.S. airstrikes. The platoon continues towards the burning oil wells of Kuwait, where Swoff and co-sniper Troy (Peter Sarsgaard) are sent on a reconnaissance mission near an airfield. After their assignment is aborted, however, there is no transport to pick them up. The snipers fear they are forgotten, or worse, that their battalion has been wiped out. They make their way over the dunes to the assumed battalion coordinates, where their story takes an unexpected turn. Indeed, as a young National Film School graduate, Deakins spent seven years shooting and directing documentaries, and even filmed in the war zones of Rhodesia and Eritrea. Still, his last narrative feature to involve much handheld work was the 1986 drama Sid and Nancy. “I’ve always wanted to do a film totally handheld, so when Sam said that, I jumped at the chance.” Jarhead ended up with a handheld look that’s subtle but effective. “It’s not like it’s rough and raw newsreel,” Deakins notes. “When I was timing the film this weekend, I thought, ‘Wow, you really wouldn’t know this is handheld.’ Every now and again, you’re running with people or whatever. But it’s mostly just a way of giving the actors freedom and lending a sense of spontaneity to the coverage. “First and foremost, Jarhead is a character-driven film,” he adds. “Sam and I felt that thinking on our feet would give the film an immediacy it might otherwise lack. In fact, during the shooting, we would often censor each others’ ideas for a shot or coverage of a scene, especially if one of us felt that what might seem to be a ‘cool’ shot would only serve to draw the audience out of the story and not into it  simply by putting them in a position that was an unrealistic point of view for an observer. I really dislike the flamboyant style of camerawork you see in many war films, where the camera soars above the battlefield or tracks behind a falling bomb. 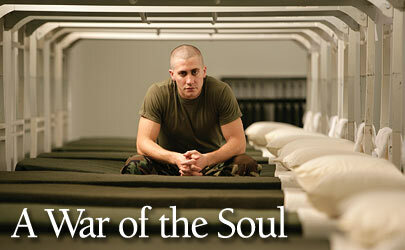 That’s just war seen as a video game, and Jarhead is certainly not that.